Thomastik has been making these “rope core” (a style of winding, not what they’re made of!) strings for a couple of years, and I must say that we’re pretty high on them right now – they’re on Bob’s Kay, and he’s really loving them for both pizz and arco. They’ve been designed for bowed work, but they have a very musical, warm pizz sound with a very sweet sustain. Their bowed feel and quick response is wonderful. Now they’re available in a new (Sept ’09) Solo Gauge! 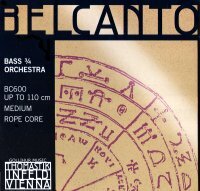 Belcantos are for 3/4 size (and possibly some 7/8 or 4/4 depending on scale length) basses, with a scale length up to 110cm (43.3 inches). They have a steel rope core and are chromium wound. Tension: G=28.25kg/62.2 lbs; D=27.75kg/63.3 lbs; A=29.25kg/64.4 lbs; E=28.75kg/63.3 lbs; Set=115kg/253.20 lbs.